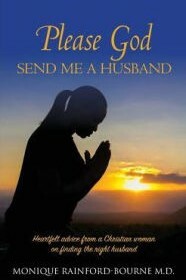 In Please God Send Me a Husband, author Monique Rainford-Bourne shares biblical advice on finding the right husband and building healthy relationships. “Marriage is not an escape from your problems,” she writes, “and many women who use it for that purpose live to regret it.” Her handy book helps women better understand themselves as they navigate the waters to matrimony. Rainford-Bourne is uniquely qualified to write this book. She is a successful obstetrician and gynecologist with additional training in psychology. She has also written about relationships for South Florida Times. While the book is based on her personal and professional experiences, she interviewed more than 50 single, married, and divorced women across cultures, races, and religions, and includes anecdotes from their relationships as well. The book is short and breezy and consists of an introduction followed by 15 chapters addressing such topics as searching for Mr. Right, knowing when you’ve found him, discussions to have before the wedding, and ways to make a marriage last. The chapters are tightly focused and well organized. The book’s audience is likely more mature women rather than teens just entering the dating scene. It might also be a resource for counselors. Overall, those seeking meaningful relationships leading to marriage and a fulfilling life thereafter will find simple, smart and insightful advice in these pages.